A World War I battleground is depicted on floats in a Mecca Day parade in 1918 on the University of Iowa campus. Mecca was an annual celebration of the College of Engineering’s departments at the time: Mechanical, Electrical, Chemical, Civil, and Architectural. Image courtesy of the F.W. Kent Collection of Photographs (RG 30.0001.001), Events and Activities Series, folder “Parades, Mecca Day,” University Archives, UI Libraries. Editor’s note: The Old Gold series provides a look at University of Iowa history and tradition through materials housed in University Archives, Department of Special Collections, University of Iowa Libraries. A century ago this spring, the United States entered World War I. Almost immediately, the State University of Iowa assumed its role as a training ground for officers and soldiers to serve in this historic global conflict. Booklet cover, Students’ Army Training Corps, 1918. Image courtesy of the Subject Vertical File (RG 01.0015.005), War Times category, folder “Civil War and WWI,” University Archives, UI Libraries. Perhaps the most visible sign on the campus’ home front was the creation of the Students’ Army Training Corps, a forerunner of today’s Reserve Officers’ Training Corps (ROTC). 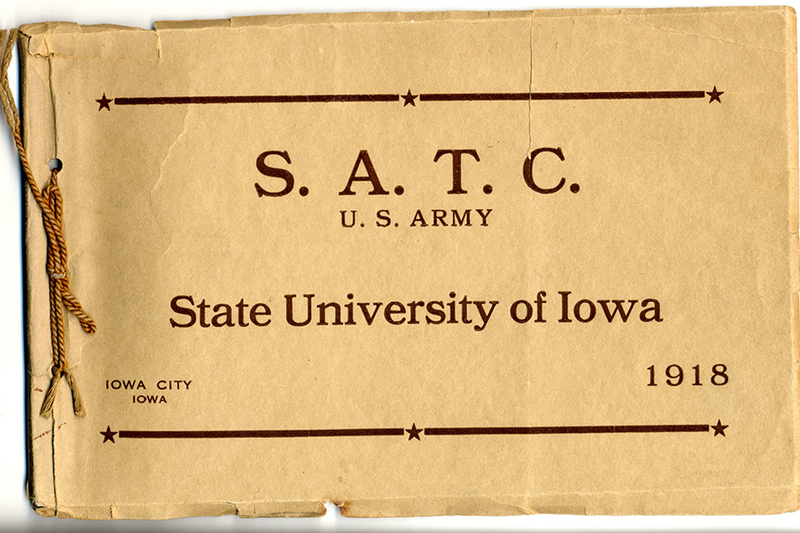 SATC was established at over 500 colleges and universities across the U.S., including SUI, in response to the war. Under the command of Captain George W. Robertson, Iowa’s SATC unit at its peak consisted of 1,700 enlisted men and 19 officers. Read more Old Gold columns in Iowa Now. In a short time, the campus became a training camp. Quadrangle, the residence hall recently demolished to accommodate the new College of Pharmacy building, was originally built as a barracks to house soldiers. Other buildings on campus became centers of instruction and physical training. 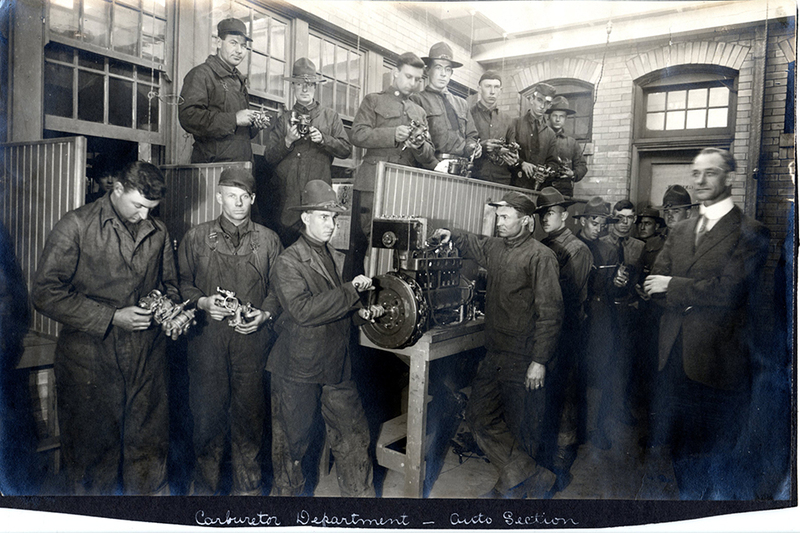 SUI engineering students enrolled in SATC program, 1918. Image courtesy of the F.W. Kent Collection of Photographs (RG 30.0001.001), Organizations Series, University Archives, UI Libraries. Ultimately, 83 men associated with SUI died in the conflict as a result of hostilities, disease, or other cause. Their names are listed in the Memorial Honor Roll as part of the Iowa Memorial Union’s dedication to those who made the ultimate sacrifice. More information about the role of SUI in World War I is available in the University Archives’ Records of Military and Wartime Service. A guide to the collection is at www.lib.uiowa.edu/scua/archives/guides/rg28.01.htm.